Opulent, rich and seductive: Rioja wine is a style so iconic that it often eclipses Spain's other delicious reds. And it's no wonder: Spain's fine wine capital, characterised by its rich tradition and vibrant innovation, has long been the country's vinous flag bearer. Modern and innovative bodegas (the Spanish term for a winery) are reinventing the local industry and combined with the region's wealth of historic producers, Rioja beautifully blends the old and the new to create sensational wines. Principal grapes: Tempranillo, garnacha, graciano, mazuelo, maturana tinta for red. Viura, malvasía, garnacha blanca, temparanillo blanco for whites. Read on for our Six to Know facts on Rioja wines; it's all you need to get started. Still want more? Click here for our in-depth guide to Rioja. 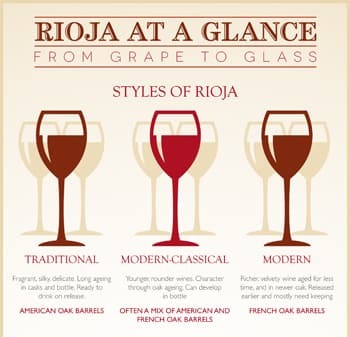 Three styles rule – In simple terms Rioja is made in three different styles: Traditional, Modern-Classical and Modern. Traditional styles are extensively aged in American oak barrels, for a silky mouthfeel and fine fragrance. Modern-Classical Riojas are younger, often a mix of wines aged in both French and American barrels. These develop well with age. Modern styles are typically rich and velvety. They are aged for a short period in French oak and therefore need longer cellar ageing than the other styles. Tempranillo is the most important grape and is at the heart of Rioja's best wines. It makes abundantly fruity, elegant wines and has a special affinity with oak-ageing, becoming graceful, silky and perfumed with time. Rampantly red: A whopping 90% of Rioja is red, with the rest being made up of rosé and white. The indigenous grapes that you'll find in your bottle are: Red – tempranillo, garnacha, graciano, mazuelo, maturana tinta. Whites include: viura, malvasía, garnacha blanca, tempranillo blanco. Rioja Alta, with vineyards that sit high up on the Sierra Cantabria, making wines with lively acidity that age well. Rioja Alavesa, further east in Basque country, produces wines with stunning fruitiness and a beguiling scent. Further south, in the eastern section, is Rioja Baja, where garnacha flourishes in the hotter, more Mediterranean climate. Rioja Blanco – We usually associate Riojas with a gleaming garnet colour. However, the few whites of the region are worth investigating. Today, many are made in a fresh, fruity style, but the best of the traditionally full, flavoursome, oaky style are a delicious too. Joven; wines that have had no oak ageing. Crianza wines must spend a minimum of one year in barrel and one in bottle before release. Reserva wines spend at least a year in barrel and two in bottle, and are some of Rioja's finest. Gran Reserva wines are usually made in the best vintages where the fruit quality is rich. This gives the wine enough quality to support two years in barrel and three in bottle.